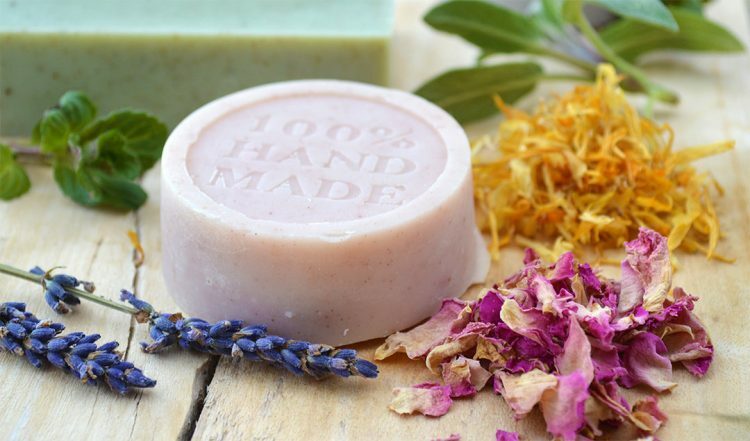 In natural soap making, herbs and flowers are used to add texture, color, and decoration. In some cases, they can also add scent and therapeutic properties. Dried rose petals decorating the tops of your bars can smell rosy, and calendula flower petals are used by herbalists to speed up the healing of skin complaints. 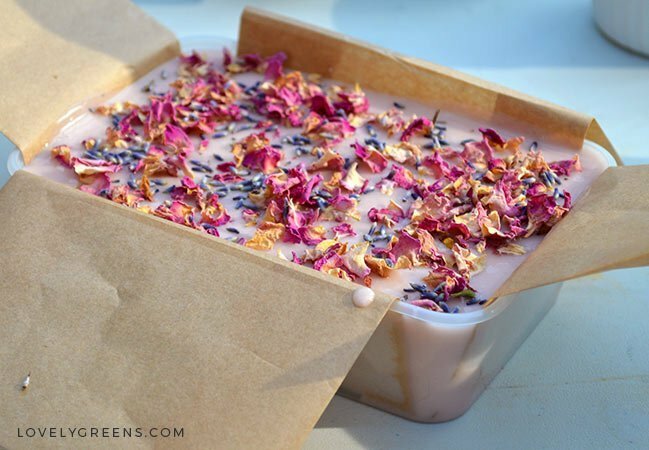 Using herbs and flowers in soap can make your bars look pretty and can sometimes add an extra benefit. This piece helps to answer questions on how and when to use them in your soap recipes. You can use ordinary culinary herbs to make handmade soap. Dried rosemary can create dark speckles, pureed parsley makes a vibrant green soap, and dried peppermint straight out of a tea bag can be sprinkled on the tops of bars as a decoration. Flower petals in soap can be a little tricky. Some of them turn brown if you try to stir them into your soap batter. Others might not be suitable for skincare recipes so please research a plant and its flower before using it. If a flower is edible, then it’s a safe bet for using in making handmade soap. When using flower petals, you have the option to use them as a puree to tint your soap, as in the case of goldenrod. 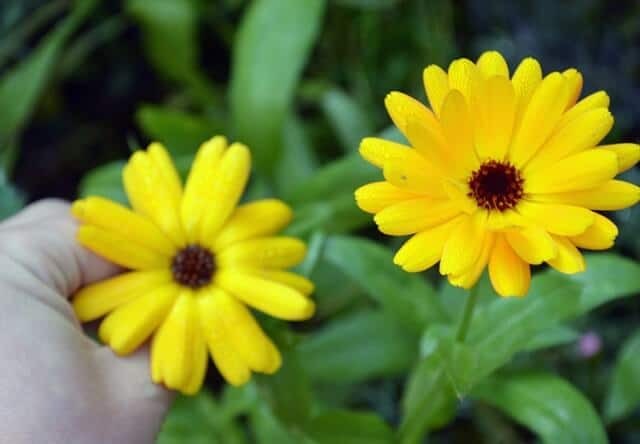 You can also sprinkle dried flowers onto the tops of your soap and in some cases, such as in calendula, you can stir petals whole into the batter. Very few flower petals will keep their vibrant color in soap but calendula is one of them. Dried herbs are easy to use in soap making. You can use them to infuse into your soaping oils or water, or you can sprinkle them into your soap batter or on the tops of your bars. Most dried herbs added whole will look dark in your finished bars. Think little dark brown and black speckles. Parsley flakes can hold their vibrant green a bit better and sage keeps a dark green tint. For a speckled effect, use dried herbs that are finely pulsed — think of the consistency of ground coffee. Add about a 1/2 to 1 teaspoon of dried herbs to every pound (454g) of soap in your recipe. Sprinkle it on your soap at ‘Trace’ and then stir it in. 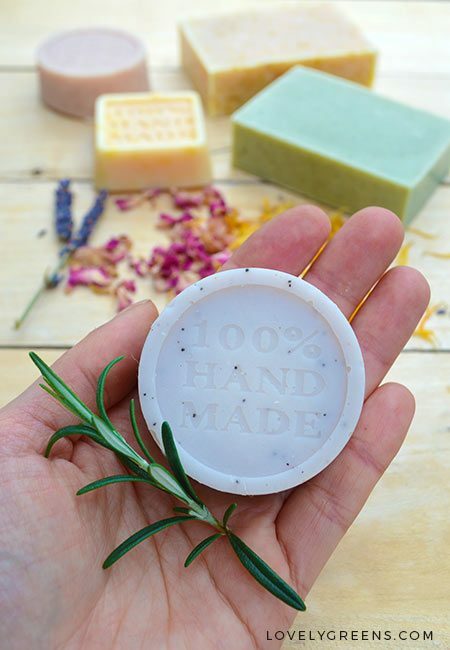 Pure, dried herbs can bleed a little into your soap as it cures, leaving a warm halo effect around each speckle. 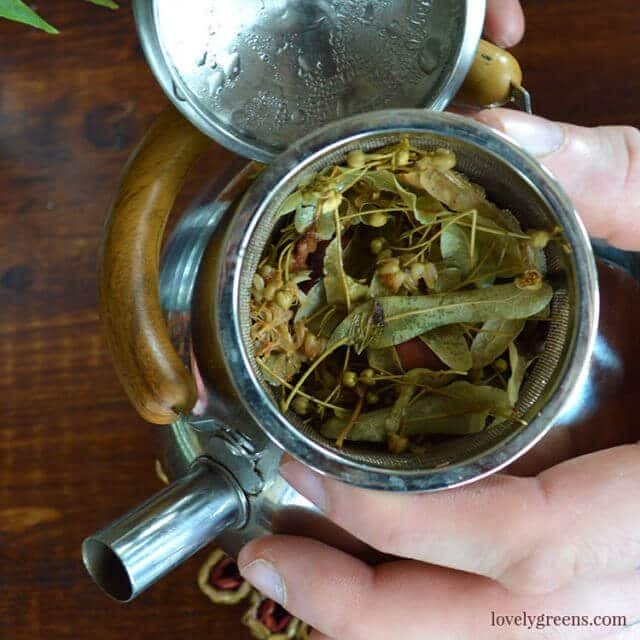 Whole dried herb leaves can also be used to decorate the tops. Theoretically they can be used in the soap batter too but be aware that they will re-hydrate after you start using the soap. 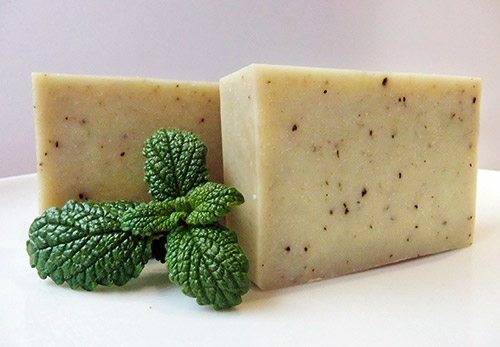 Imagine full sized, and potentially slimy, peppermint leaves in your soap. Dried herbs can also be infused into oil or water and then used in your soap recipes. 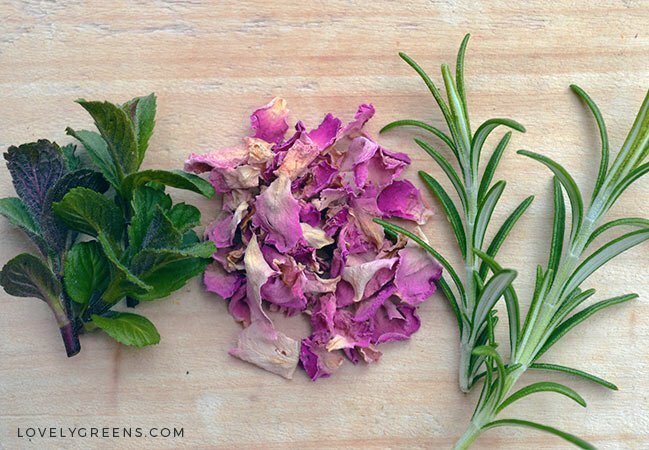 The scent probably won’t hold but infusing herbs give color and therapeutic value. Adding fresh plant material to soap can cause issues including your soap growing mold. This happens when microorganisms begin growing in the water still inside the plant material and it occurs more often with whole plant material added fresh. When a herb is pureed, you can add it in small quantities to your soap batter at ‘Trace’. As the water content evaporates out of your soap during the curing process, so does the water content of the herb. Chunks of fresh or cooked plant material, be it leaves, petals, vegetables, or fruit, can spoil your soap if added to soap. However, some culinary herbs are relatively dry to begin with and can be added fresh. Rosemary, lavender leaves, and thyme can be chopped up and added fresh at 1-2 tsp per pound of oils in your soap recipe. I’d advise caution when adding wetter herbs in this manner though. Adding flowers to any natural soap recipe can transform an ordinary bar into a botanical treasure. 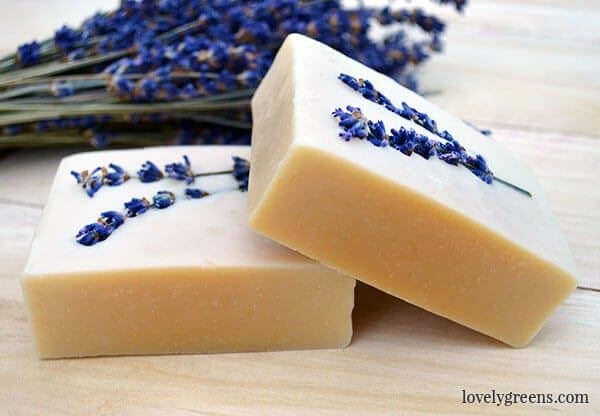 Take for example my lavender & honey soap recipe. The bars in themselves are great for your skin and beautifully scented but it’s the dried lavender on top that makes them special. Decorating the tops of soap batches with dried flowers is very popular in the soap making lessons I give on the Isle of Man. Many dried flowers such as cornflowers, chamomile, and rose petals will keep their color (for several months at least) if sprinkled on the tops of soap. The key tip is to not insulate the soap after since this extra heat can turn the flower petals brown. Mixing dried flowers into soap batter will often turn the flower petals brown. This is sadly the case for flowers such as rose petals and lavender but and exception to the rule is calendula. It holds it’s sunny yellow or orange color indefinitely. You can also use dried flowers to make a tea that is used in place of the water in a soap recipe. Most of the time the color of flower petal infusions won’t hold up in soap recipes but its possible that some therapeutic properties will survive. Some dried flowers can be infused into oil. Calendula flowers come in both yellow and orange and I find the orange petals infuse beautifully into olive pomace oil and other light colored oils. You can use this colored oil to form the main soaping oils in your recipe and naturally color your soap. You treat fresh flowers much the same as you would wet plant material in soap — with caution. Large pieces of fresh plant material can grow bacteria and mold if they don’t dry out quickly enough. If you’re going to use fresh flowers in soap, you should opt for pureeing them or using them in a water infusion. Many flower petals will turn your soap brown if you use them in a pureed form. Exceptions include calendula, goldenrod, and daffodils. These golden petaled flowers will all tint your soap buttery hues of yellow to orange. To make a puree, blend your fresh flower petals with enough water to make a thick soup. 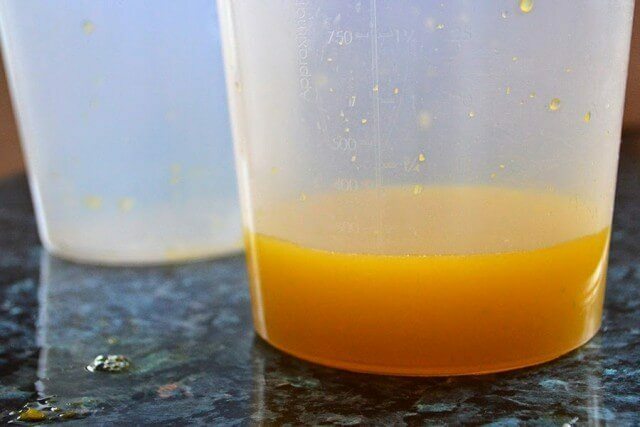 Use this puree to replace up to half of the water content of your soap recipe. You can also use fresh flowers in a water infusion, basically a tea. This pretty pink Hollyhock soap recipe isn’t colored by flowers but the infusion helps soothe and calm the skin. 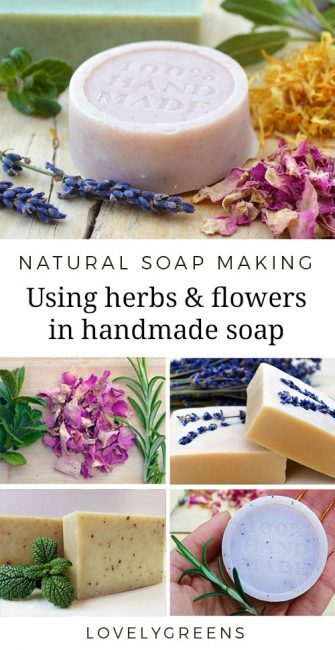 The herbs and flowers that you use to make handmade soap can come from the supermarket, a farmers market, or your own garden. I personally think that using homegrown adds a special story to your handmade products. Just imagine soap decorated with your own rose petals or cornflowers! Some can be grown in pots and containers and others will prefer growing in a border. On Lovely Greens you can find a lot of tips for growing herbs and flowers for skincare recipes. Begin with finding out to grow and harvest Lavender, then move on to learning more about Calendula. It’s probably the most versatile skin herb that you can grow. Herbs help us improve our health every day, I love to see the herbal flowers come from nature. Your writing is great, I learned a lot from this. Do you know how much of the herbs and flowers properties/benefits are preserved in cold processed or hot processed soaps? I can’t find any proper information about it (scientifically based). I suppose it is best to add them at trace in cold processed and after cook in hot processed? I’ve never come across a scientific piece on the topic either. Adding at Trace/after cooking would help to preserve any properties in theory — essential oils survive the process so it’s conceivable that botanicals could too. Being new to self sufficiency via my allotment with food I’m branching out in plants and herbs I can use at home this will be a great addition!